The No Bolt range of scaffolding is fully welded, not riveted or crimped, resulting in good strength, safety and durability. No Bolt uses 6061-T6 high-grade structural aluminium in the construction of its scaffolding, which means a harder and more resilient product. 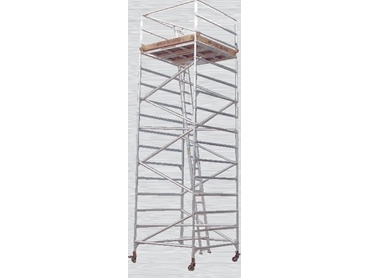 The scaffolding is simple to erect, with a minimum of components and no separate clips, clamps or wedges. The tube diameter is standard and permits use with other scaffolding fittings. Safety, ease of use, minimal maintenance and good durability are the hallmarks of a tower manufactured by No Bolt.